Each year, the American Planning Association, Arizona Chapter recognizes outstanding efforts in planning and planning leadership. This acknowledgment inspires quality and innovation in the planning profession and builds awareness of the field's importance to cultivating thriving communities. Nominating exemplary work or an outstanding individual is a revered opportunity to honor planning excellence and noteworthy contributions to the planning profession. 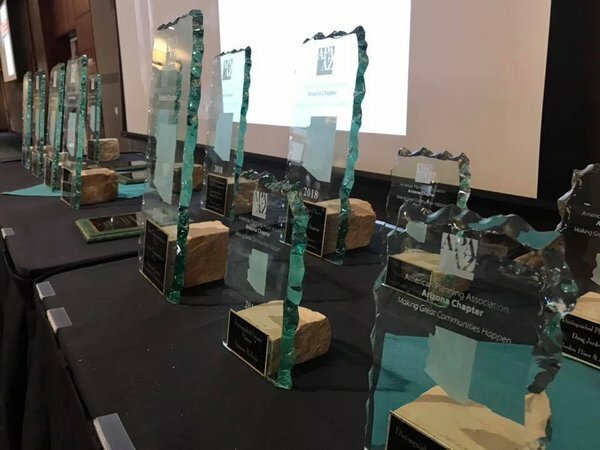 The 2019 APA Arizona Award Recipients will be recognized during the Annual Planning Conference Awards Luncheon at the Hilton El Conquistador in Oro Valley, Arizona this September. Please take time to nominate the plans, projects, and people raising the bar for planning achievement in Arizona. Arizona Chapter winners will possibly ascend to win awards at the national level! Please refer to the Awards Brochure for all nomination information. The APA Arizona Chapter gets you involved in APA close to home. We're your local source for networking and professional development. You'll share experiences with colleagues and broaden your perspective beyond your office. We provide a variety of services that demonstrate the significant value of membership, providing opportunities that allow planners to grow their careers, networks and skills. The vision for APA Arizona is to be the recognized leader and authority on planning related issues in Arizona. With this leadership, we will positively influence our communities through our members, resulting in the creation of exceptional communities that are recognized for the quality of their built environment, care and sensitive treatment of the natural environment, and attention to the creation of equitable and sustainable communities and economies. Watch more on APA's YouTube channel!